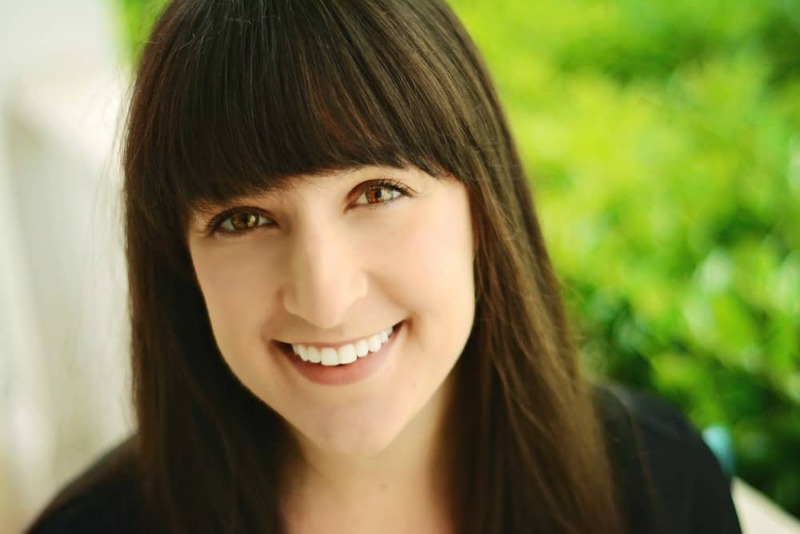 February 3, 2014 By Liz 33 Comments Note: This post may contain affiliate links. I haven’t been eating as many salads lately since it’s been so chilly. This meant that I had a couple of bunches of kale sitting in my fridge, begging to be used. I finally decided I’d use them up on a warm kale salad. After having such a delicious dish at The Savory Grain, I had a rough idea in mind of how I wanted to turn out. 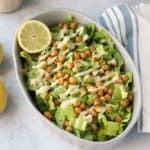 This actually turned out to be a simpler salad than I thought and I think this would be a lovely side dish, or a main dish if you added a little quinoa or protein. Let me say it again: Kale is a tough green and it needs massaging to make it tender. After you’ve washed your kale, you want to literally massage it with your hands. I typically massage the dressing right in. 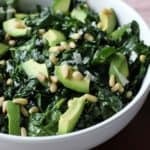 Since this kale salad is served warm, it’s not as critical but it will still produce a better texture. Use the right dressing. Kale is a very bitter green and it needs something to help soften it a bit. 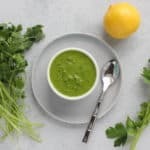 An acidic dressing will help break down the fiber in the kale which will make it easier to chew. Remove the kale stems. The stems are extremely bitter and very hard to chew. Do yourself a favor and de-stem the kale. You can either fold the leaves in half and slice the stem off or you can just tear the leaves right off the stem. 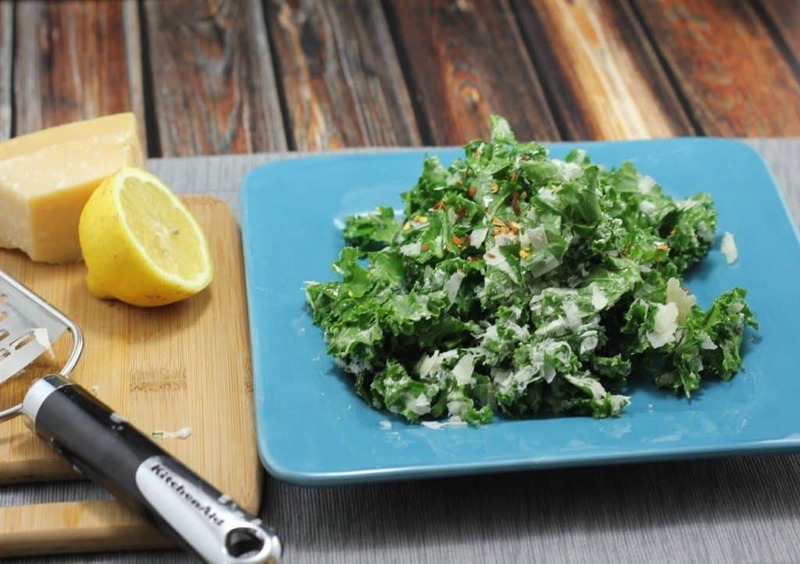 This warm kale salad is a simple side dish recipe that only takes a few minutes to make! Heat up the oil in a large saucepan, and add in the minced garlic. Tear the kale into small pieces, removing the stems. Add them to the oil and toss to coat. Cook the kale over medium heat for 2 minutes, just until it softens. It shouldn’t take long, and you don’t want it to get soggy. Juice half of a lemon, and drizzle over top. Toss with the shredded cheese and red pepper flakes. Sometimes I add a few crushed red pepper flakes for a spicy flavor! It’s so simple but so delicious! I love serving this with my spaghetti squash lasagna but you could also add your favorite protein on top and make it a meal! Looking for some other kale salad inspiration? 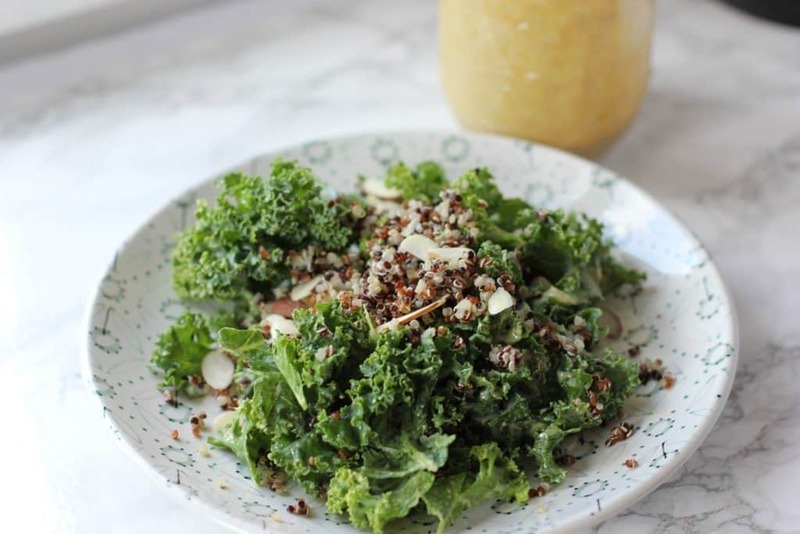 Try this kale and quinoa salad! 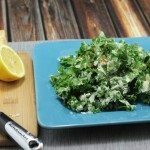 Have you ever tried a warm kale salad? I love kale cooked. I love spinach cooked too. Those are two greens I have a hard time eating raw. This looks like something I’d really like! 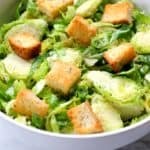 I’ve recently been getting into warm salads. I think kale and arugula is tied for my favorite greens actually. I have totally been on a kale kick lately. Most days I have been eating raw kale in salads for lunch at work, but this cooked one looks even better! Hey! I was JUST looking for a warm salad for dinner tonight since I’ve been freezing all day. This one sounds good – even if I’m skeptical about kale. I mean I enjoy it in my smoothies, but alone… eh i just don’t know? 🙁 Ha Ha! I have been on a kale chip kick so I have plenty of kale in the house to use for a salad. Funny thing is, I was just thinking that maybe I would make one for lunch and then saw your post lol. So jealous of that barre class, it looks so fun! I haven’t taken barre since the holidays and I miss it. I got in a good run while the weather was so nice yesterday! Yes! 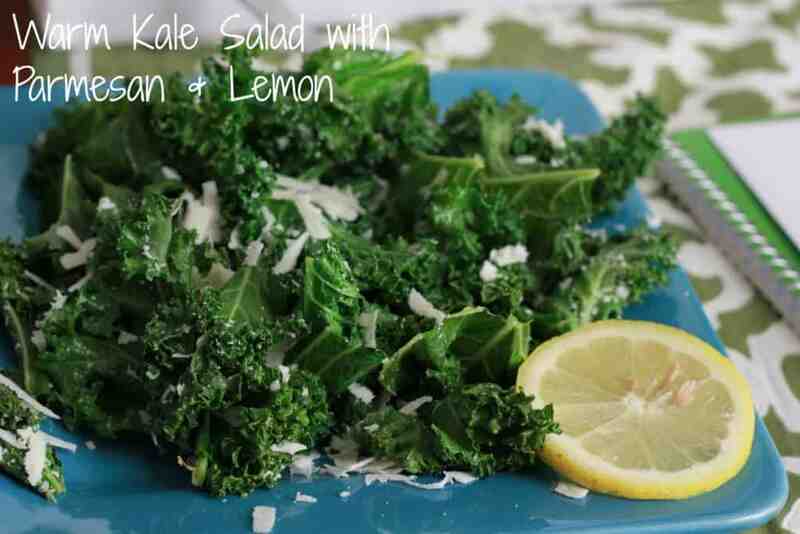 I love what parmesan cheese and lemon do to kale. It’s also nice to toss in any leftover roasted veggies lying around! I swear, it is nearly impossible to time an avocado correctly! i had a pretty low key weekend and was able to get some meal prep done. Ooooh what a lovely idea! This sounds wonderful! Love the flavor combination! I still have some kale left in my fridge. This may be its use! Oh wow! Good for you!!! 🙂 That’s amazing! Thanks for planning the Richmond Barre meet up! It was really fun. And, for the record, I’m still sore. haha. I’ve been reading so much about Barre classes lately, I need to check this out after the baby is born! yum! come to think of it, i haven’t made salads very often because this cold weather! i did order one at the restaurant yesterday though – itz always better when someone else makes it haha! Oh wow – this looks good! I just started eating kale again (I took a hiatus and was eating mostly spinach.) Anyways, this sounds so good and perfect for a cold winter night! Fun! I want to take another barre type of class. I’ve only done one, and oddly enough I wasn’t sore at all afterwards… though I was def shaking the entire time! mmmmmmmmmm kale salad, easy and no mess 😉 Doing it today for dinner!